It’s hard to believe that it’s already the last day of October; talk about time flying! When we ushered in October I had only been back home from Florida for a mere week, the sun was still shining and my flip flops were still in my shoe rotation. Thirty-one days later, my feet are more than ready for my fuzzy, cozy boots, many parts of the country are already seeing their first snowfall, and the East coast was just walloped by a massive storm. I hope any of you that were in Sandy’s path are staying safe and warm! 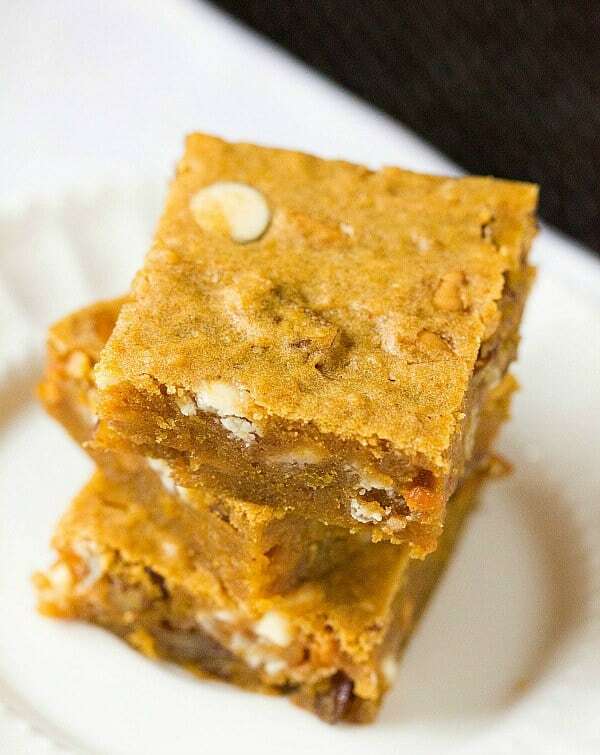 I decided that since I kicked off October by sharing my favorite pumpkin recipes with you, that I should close it out with yet another fantastic way to use up that can of pumpkin hanging out in your pantry! I absolutely adore brownies, and believe that their lesser-known cousins, blondies, can be terribly underrated. 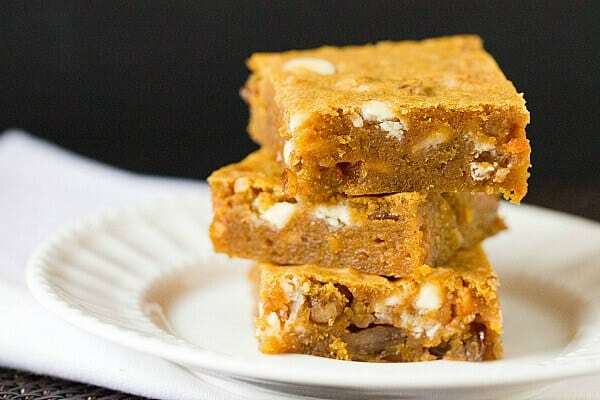 Sure, they don’t include chocolate, but if you prepare them in just the right way, they have that same dense, fudge-like texture and thin, crackly crust that brownies have. Throw in the incredible array of flavors that you can add to blondies, and you have a blank canvas of possibilities that would make Bob Ross jealous. 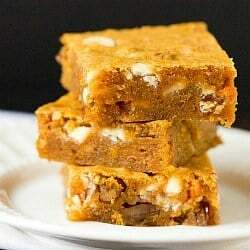 In addition to pumpkin, these bars are chock full of butterscotch chips, white chocolate chips and chopped pecans. Every bite is an explosion of flavors, textures and gooey pumpkin deliciousness. If you’re looking for a quick and easy dessert to get you through passing out candy or a scary movie marathon tonight, these definitely have your name written all over them. Goodbye October, thank you for the beautiful leaves. I’ll see you next year! 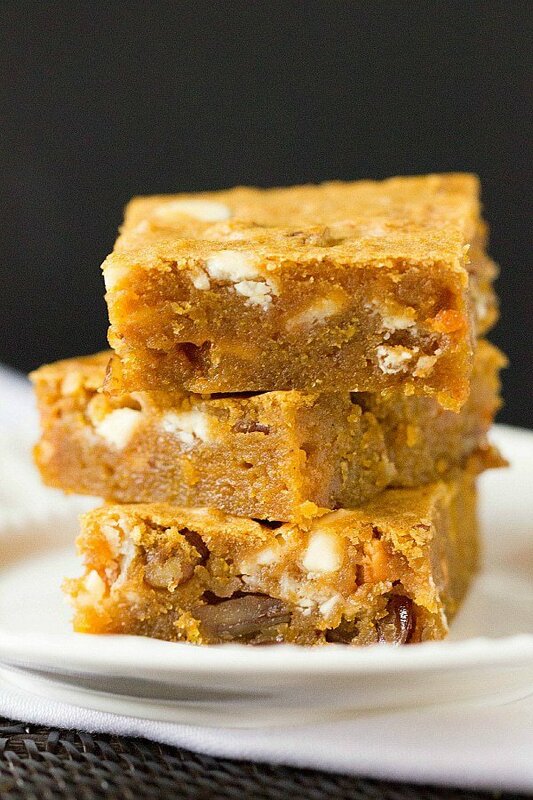 Gooey Pumpkin Blondies loaded with butterscotch chips, white chocolate and pecans.